More than a five hours’ busride away from Nairobi in the Kenyan highland, at 2300m elevation, no electricity … these were the conditions, under which 34 enthusiastic children from ages 10 to 14 came together for a Tree-Planting Academy on November 21st. In the days leading up to the event, the challenges seemed daunting. When it finally came, though, the harmonious course of the day left lasting impressions on the memories of the attendees and shaped the landscape with 100 newly planted trees. Children and Kijani members are gatheringin in the Kenyan highlands to plant trees. Kwanjiku is the name of the village close to which we, in Kijani, set ourselves the goal to restore a Kenyan highland forest and empower the local youth. What could be more conducive to this aim than letting the young generation take part in actively experiencing the beauty of nature and to take steps toward reinstating a healthy environment? This is what this day of the “Academy,” a concept developed by our global partner and tree-planting champion (nearly 13 trillion! trees) Plant for the Planet enabled everyone to do. 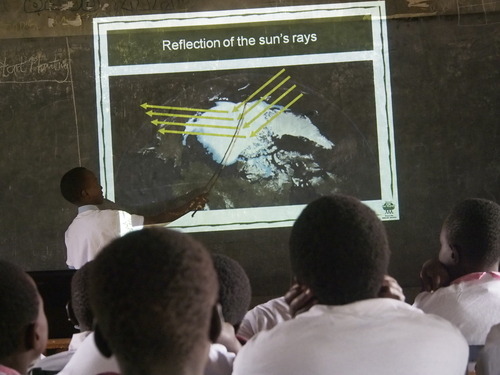 Kenyan children learning about the Grenn-House effect. The encounter of students from four schools from grade five to eight and the active planting of trees gave life to the role of the forest in climate change mitigation and adaptation. The PowerPoint presentation, made possible through a generator brought from Nairobi, was held by two Climate Change Ambassadors. The joy the two students embodied was phenomenal and carried the Academy participants from the highland on a wave of enthusiasm for climate change action. As if they had had years of teaching experience, the Ambassadors gave detailed explanations about complex interactions of the global climate system and wakened the fascination of the 34 Academy participants. Strengthened from a traditional lunch—ugali (mashed corn), sukuma (kale), and matumbo (beef)—the planting action began. The forester of North Marmanet explained and introduced the students to the art of tree planting. The children were thrilled and rushed to plant trees—maybe the first ones of their lives. Besides children, local government representatives, a headmaster, a teacher from Nairobi, and the founder of a Kenyan environmental group attended the Academy. The collaborative tree planting created a cordial and hopeful ambiance and an abundance of creative ideas about how to continue promoting tree planting in the community. At the end of the day, children happily held their certificates and competed for who could shoot the funniest “Stop Talking, Start Planting” photos. We thank everyone who has contributed to the success of the event and are looking forward to continue to engage community members, old and young alike, to take active steps for a healthy environment and a young generation of climate leaders.